The Nærøyfjord and Aurlandsfjord tourist attractions. 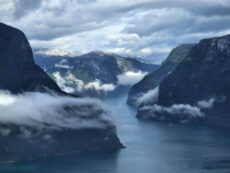 These two arms of the Sognefjord are both beautiful and dramatic. The Naeroyfjord and Aurlandsfjord are located in the southern part of the county of Sogn og Fjordane, in the middle of Fjord Norway. Aurland, Flåm and Gudvangen are small towns situated by the two fjords.